I work for one of the local school districts and just got an automated phone call and text message that schools are going to be closed tomorrow due to numerous threats. Of course my first priority is that all the children are safe, but I find it disgusting that there are people out there that would threaten the lives of innocent children just because they can. 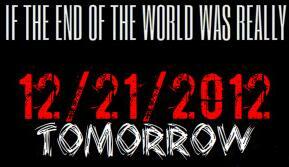 Tomorrow is also the day that the world is suppose to come to an end... I guess I get to sleep in, so I won't know what hit me if it happens! I wish mine was closed. It is sad that people are allowed to rob happiness and safety from others. Glad you will be sleeping in though. Thank goodness we're already out on break! That is so sad, but not surprising. We've had a kid get suspended here in S. Fl for making threats, and the press around him going to court etc. seems to have prevented more threats from other kids. I hope they find out who made the threat and throw the book at him or her. This is awful any time, but especially after the tragedy in Connecticut.